Bouncing back and forth from LA, NYC, Montreal, Mexico and Seattle on top of being in a big ol' creative rut, I haven't been crafting much. Oh. And I've become an addict. 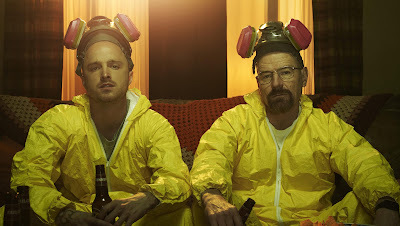 I am obsessed with Breaking Bad. [Late to the game? I KNOW]. I powered through all five seasons like a fiend. I landed in Los Angeles just in time for the final season's premiere and let me tell you...I was ready to cook. I baked some Breaking Bad cookies. Bad frosting job due to my unsteady hand. Aren't my meth cookies cute? This batch wasn't my best. I guess Walter White and I work best under pressure. I'm not sure what makes me happier. These cookies or Bryan Cranston.